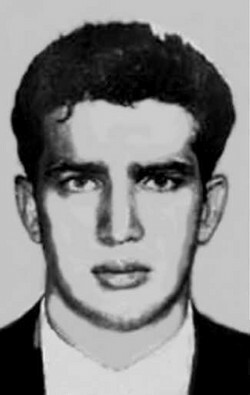 A 22-year-old hood, Abraham Telvi was recruited by labor racketeer Johnny Dio to acid-blind crusading labor columnist Victor Riesel in 1956. Eager to get ahead in organized crime, Telvi agreed to the proposition, according to a federal investigation, by Joseph Peter Carlino. Fingered by Gondolfo Miranti, Riesel found himself confronted by Telvi at about 3 A.M. as Riesel was leaving Lindy's, a famous New York Broadway restaurant. Telvi hurled sulphuric acid in Riesel's eyes and face, blinding him permanently. Eventually, Miranti and another man involved in the plot were all set to identify Dio as the mastermind of the attack, but in the end refused to testify because of underworld threats. Charges against Dio and three others had to be dropped. Telvi did not fare nearly as well. He had been paid a meager $1,175 for doing the job, and when he saw the heat being generated in the investigation, he angrily started dunning Dio and the other conspirators for a more equitable reward. In mid-July, Telvi was told he would get his bigger payoff in two weeks. The promise was not broken. On July 28, exactly two weeks later, Telvi was murdered in gangland style on the Lower East Side.